Olympus, known worldwide from ancient Greek mythology, is an extensive solid mountainous mass, with several peaks well above 2,000, the highest of which is Mytikas at 2917m. It has been designated as a National Park since 1938, for its geological formations, its flora and fauna with its many rare species. He has also been designated as archaeological and historical site since 1985 while in 1981 UNESCO listed it as preserved part of the global biosphere. Litochoro is not only the starting point for the climb up Mount Olympus but also the place to stay for nature lovers, hikers and mountain climbers. 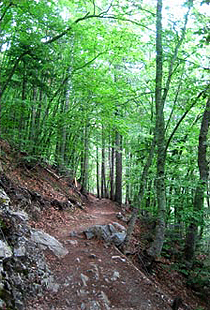 The climb up Mount Olympus for the peaks and mountain refuges is done through a variety of hiking and climbing routes, the best known of which is the international path E4. The trail E4 begins from Litohoro and crosses the Enippeas canyon through dense forests and picturesque waterfalls. Short trips on foot or by car can take the visitors to St. John "Agios Ioannis", the monastery of St. Dionysius, the refuge of Stavros and the spot Prionia.